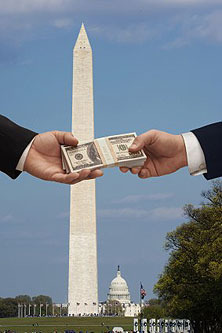 idea: How about a constitutional amendment to ban big money in politics? The idea, floated by various left-leaning groups in recent days, is to build a grassroots campaign behind an amendment to reverse Citizens United, which laid the groundwork for the Super PACs that are expected to pump unlimited sums into the 2012 campaign, with untold consequences for our politics. Now that campaign is about to take a new turn: Lefty groups are going to call on President Obama himself to support such a step. There are two ways to react to this. The first is substantively: would this be a good idea on a public policy level? I’d be shocked if someone could convince me that it was. As near as I can tell, just about every campaign finance reform measure of the modern era has either (a) had no real effect, or (b) backfired, making things objectively worse. The idea that we can predict the effect of yet another proposal well enough to set it in stone in the Constitution strikes me as extremely unlikely. But then there’s the second way to react: is this a great fundraising issue for Democrats? On that score, I’m sure the answer is a big fat Yes. In fact, just as abortion is for the right, it’s probably a perfect issue, one that gets everyone riled up and is unlikely to ever go away. Ironically, endorsing a constitutional amendment to change the way campaigns raise money is probably a great way for campaigns to raise money.